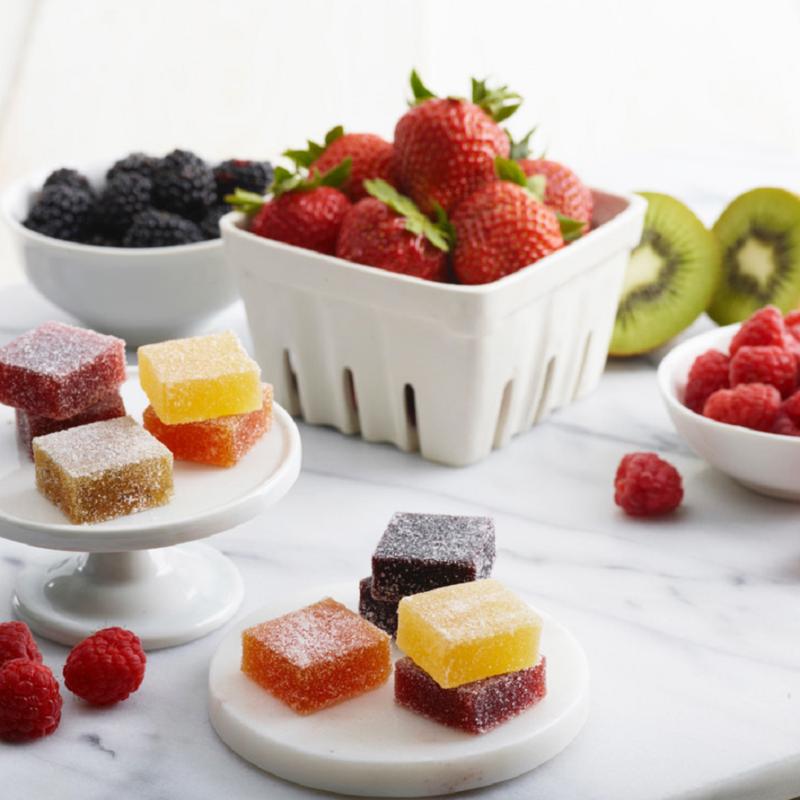 This 15-piece fruit square assortment highlights strawberries, raspberries, blackberries and apricots, plus two new flavors: kiwi and pineapple. To make them, we heat pure fruit puree to a high temperature, mix in sugar and pectin in small amounts, then slowly cook the mixture until it arrives at just the right consistency. The puree is then poured into a square frame, allowed to cool, then cut into one and a quarter inch squares. Finally, the cut squares are tossed in organic sugar three separate times over a period of two days. They are as fresh and supple as could be and are better than any French pate de fruits we have found. 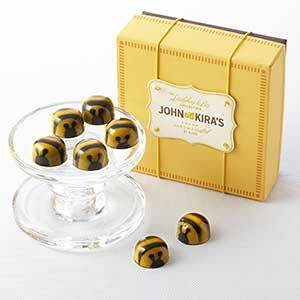 "I received John and Kiras Fruit Squares as a gift from a client (I'm a veterinarian) and they were the most wonderful things I had ever tasted. I have searched for 2(?) years to find them and HERE THEY ARE! I am so serious. When we got toward the end of them I cut each one into 16 tiny pieces so everyone could try each flavor. They really are THAT good. Thank you! Contains: fruit puree (raspberry, strawberry, blackberry, kiwi, pineapple, and apricot), sugar, glucose, citric acid, and pectin. Made on shared equipment with milk, soy, gluten, tree nuts, & peanuts. 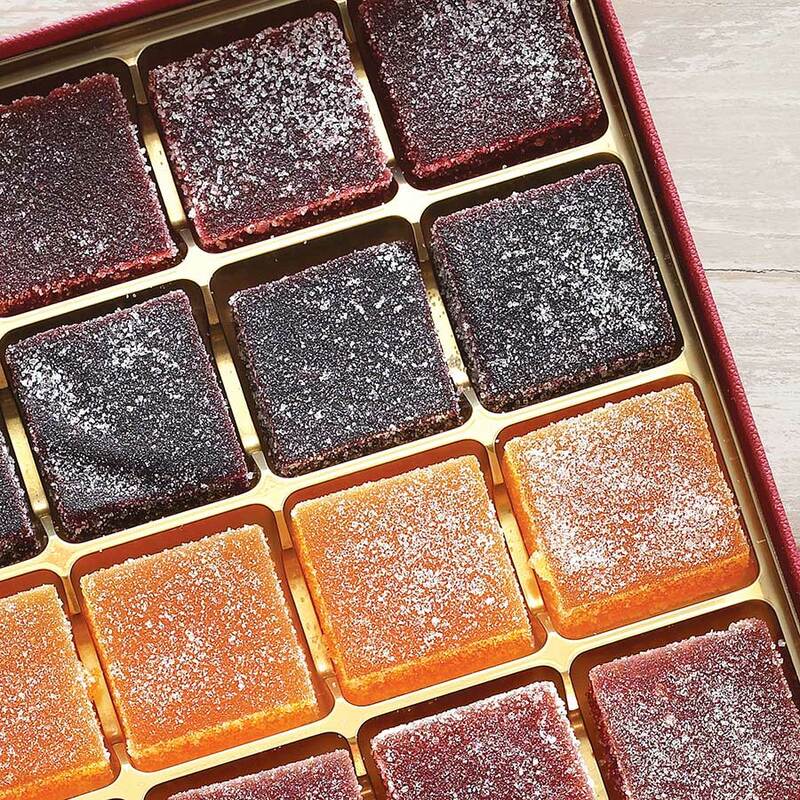 HIDDEN WITHIN A MENU OF OUTSTANDING CHOCOLATE TREATS IS A DELICIOUS TASTE BUD TINGLING FRUIT JELLIES IN DELECTABLE FLAVORS! 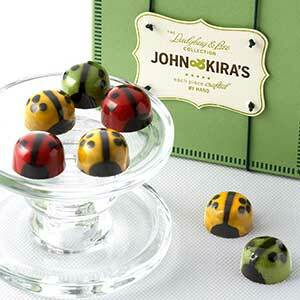 THESE ARE A FAVORITE OF OUR HOUSEHOLD WHEN WE DON'T HAVE THE INFAMOUS FIGS TO ENJOY! These fruit squares are amazing, each one bursting with flavor. I am addicted! Received fruit squares as a gift and they were absolutely delicious! Thoroughly enjoyed by the entire family and uniquely packaged in a wooden box with ribbon. What a great gift!!! These are so delicious I get cravings for them. These are the BEST pate de fruits in the region. There is always something "off" with American made ones but yours are fantastic. My other favorite ones come from Bern, Switzerland. Thanks so much for the pleasure. Will place my order for Japan soon. 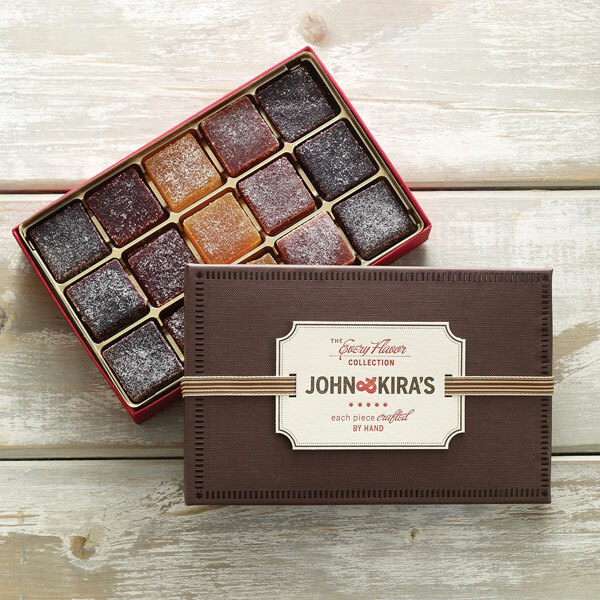 I received John and Kiras Fruit Squares as a gift from a client (I'm a veterinarian) and they were the most wonderful things I had ever tasted. I have searched for 2(?) years to find them and HERE THEY ARE! I am so serious. When we got toward the end of them I cut each one into 16 tiny pieces so everyone could try each flavor. They really are THAT good. Thank you!